To nobody's surprise, canine bloat is exactly what it sounds like – a bloated stomach that makes your dog incredibly uncomfortable. But unlike humans when they enter a food coma, this can be very dangerous for dogs. I had no idea what canine bloat was until my friend’s Basset Hound had to be rushed into the emergency vet one night, and the vet said her dog could have died. My friend’s vet said canine bloat is more common in specific large breeds with broad chests, because of the way their stomach and intestines are designed. Because of this, owners of Great Danes, Irish Setters, Weimaraners, St. Bernards, Boxers, Basset Hounds and German Shepherds should really know the signs of canine bloat and how to prevent it. If you notice your dog’s stomach bloating, accompanied by restlessness and pacing, gagging (trying to vomit, but nothing comes up) or drooling, you need to get to the vet ASAP. There are a number of causes of canine bloat, especially in breeds with this predisposition. Read on to learn how to prevent canine bloat. A lot of large breed dogs tend to eat a lot of food. It’s hard for their owners to prevent this, as these large dogs scarf food down the second they have access to it. But if you have a dog from any of the breeds above, you really need to watch their food (and even water) consumption. Dogs with poorly designed stomachs have issues when the food hits their gut. Food naturally expands as it’s exposed to the acids in the stomach, and this can cause your dog’s stomach to stretch. It can also cause the stomach to twist (gastric dilatation volvulus, in case you wanted a tongue twister), or even tear. This cuts off blood flow, prevents oxygen from traveling around the body and sends your dog into shock. In order to prevent this from happening, give your dog smaller amounts of food multiple times a day or buy a “maze bowl” that forces your dog to push food through the bowl before he or she can grab it and eat it. The same goes for water; only give small amounts at a time until he or she is hydrated. You know how humans aren’t supposed to go swimming for 20 minutes after eating to avoid cramps (supposedly)? Dogs who are predisposed to bloat should really be kept calm until they’ve properly digested their food for similar reasons. Too much activity can cause the same problems as overeating; twisted stomach, tears, etc. By keeping your dog calm, the stomach and intestines stay where they should, and food can pass without struggle. If you have an especially active dog, try exercising him before he eats. Also, make sure they calm down before you put the food or water in front of them. This way, they associate feeding time with calm, and they can pace themselves while eating. You kill two birds with one stone; exercise and food monitoring. You wouldn’t think something as small as the angle of a food bowl would really matter, but you'd be wrong. Unfortunately for my friend, she found out just how important the placement of her dog’s food bowls really were after she rushed her Basset Hound to the vet hospital. The vet told her that dogs are supposed to consume food with their heads at a downward angle because it encourages proper chewing before swallowing. Dogs with raised bowls tend to just lick up the food and swallow quickly because of the easy angle. Who knew, right? This is another easy problem to fix. Just put your dog’s food and water bowls on the floor, and try to monitor him to make sure the food is going down slowly rather than all in one large gulp. We’ve seen our dogs scarf down insane amounts of food as puppies, or drink gallons of water after a long walk with no problem. But as our dogs get older, we start noticing that they eat slower, or they have problems eating, or they even get a little bloated and uncomfortable. As a dog ages, vets think that something happens to their stomach that makes them a little less able to digest food properly. Any wrong movement, any “too large” chunk of food, or any sort of stress to the stomach can cause bloat. If you have one of the predisposed breeds, you should really watch his eating routine as he gets older just to make sure something hasn’t changed. If you notice any symptoms, like bloat, heavy breathing, gagging, etc…take your dog to the vet immediately. Sometimes, though, our dogs are just designed to have trouble. Like many dogs have bad teeth, bad hips, or are more likely to have skin problems, the dog breeds listed above are predisposed to canine bloat. I know this is probably starting to sound repetitive, but it's imperative that you keep a close on any dog for signs of canine bloat, and especially if they are genetically predisposed to the condition. 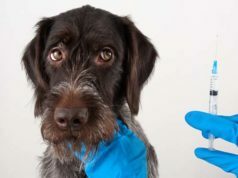 If your pooch has a genetic condition, you know there’s not much to do about it besides treat the symptoms and try to prevent issues from arising. If you have a Basset Hound, Boxer, Great Dane or other bloaty breed, ask the breeder (if you have contact information) to give you a history of your pup’s parents and lineage. Sometimes, this can help you see if your dog’s parents died from canine bloat or if they had a couple of scares. Sometimes, it doesn’t show anything, but it’s worth a look to make sure your dog isn’t especially prone to bloat. If your dog is genetically predisposed to canine bloat, talk to your vet and make sure that you’re doing everything you can to prevent issues. Talk to the vet about what food is best, if there are any activities you should avoid and what to look for to make sure you seek medical treatment as quickly as possible if your dog starts to bloat. You know the old saying, “an ounce of prevention is worth a pound of cure?” This is never truer than with our furry friends. Veterinarians stress the importance of a slow, proper diet for dogs who are prone to canine bloat, but also for dogs who have no history. Why? Because canine bloat can come on quickly, and can quickly turn deadly. While taking your dog to the vet as soon as you see symptoms is the best way to make sure he will be OK, canine bloat can be tricky to treat. Don’t risk it, and do everything you can to help keep your dog happy and healthy.